The Khmer Rouge ( /kəˈmɛərˈruːʒ/ , French: [kmɛʁ ʁuʒ] , "Red Khmers"; Khmer : ខ្មែរក្រហមpronounced [kʰmae krɑ.ˈhɑːm] Khmae Kro-hom) was the name popularly given to the followers of the Communist Party of Kampuchea (CPK) and by extension to the regime through which the CPK ruled in Cambodia between 1975 and 1979. 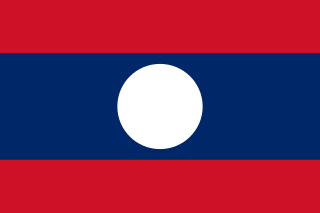 The name had originally been used in the 1950s by Norodom Sihanouk as a blanket term for the Cambodian left. The Pathet Lao was a communist political movement and organization in Laos, formed in the mid-20th century. The group was ultimately successful in assuming political power in 1975, after the Laotian Civil War. The Pathet Lao were always closely associated with Vietnamese communists. During the civil war, it was effectively organized, equipped and even led by the People's Army of Vietnam. They fought against the anti-communist forces in the Vietnam War. Eventually, the term became the generic name for Laotian communists. The Khmer Rouge regime was highly autocratic, xenophobic, paranoid, and repressive. The genocide was in part the result of the regime's social engineering policies. Its attempts at agricultural reform through collectivisation led to widespread famine while its insistence on absolute self-sufficiency, even in the supply of medicine, led to the death of many thousands from treatable diseases such as malaria. The Khmer Rouge's racist emphasis on national purity included several genocides of Cambodian minorities. 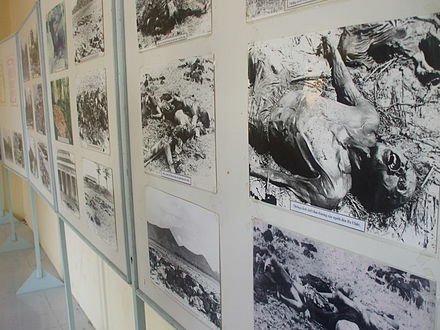 Arbitrary executions and torture were carried out by its cadres against perceived subversive elements, or during genocidal purges  of its own ranks between 1975 and 1978. The regime was removed from power in 1979 when Vietnam entered Cambodia and quickly destroyed most of the Khmer Rouge's army. The Khmer Rouge then fled to Thailand whose government saw them as a buffer force against the Communist Vietnamese. The US and China and their allies, notably the Thatcher government, backed Pol Pot in exile in Thailand, providing the Khmers with intelligence, food, weapons and military training. 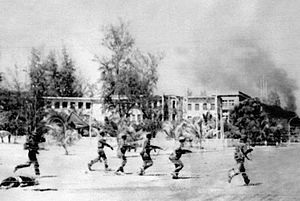 The Khmer Rouge continued to fight the Vietnamese and the new People's Republic of Kampuchea government during the Cambodian–Vietnamese War which ended in 1989. In 1996, a new political party called the Democratic National Union Movement was formed by Ieng Sary, who was granted amnesty for his role as the deputy leader of the Khmer Rouge. The organisation was largely dissolved by the mid-1990s and finally surrendered completely in 1999. In 2014, two Khmer Rouge leaders, Nuon Chea and Khieu Samphan, were jailed for life by a United Nations-backed court, which found them guilty of crimes against humanity for their roles in the Khmer Rouge's genocidal campaign. The Khmer Rouge dissolved sometime in December 1999. The Democratic National Union Movement (DNUM) is a Cambodian political party founded after senior Khmer Rouge official Ieng Sary's defection from the Cambodian National Unity Party in August 1996. A magazine entitled Phka Rik is associated with it. It was created primarily to facilitate Ieng Sary's reentry into civilian political life, claiming neutrality and that he had broken away from the Khmer Rouge and from the "fascism and cruelty of Pol Pot's regime," naming Nuon Chea, Ta Mok, Son Sen and Yun Yat as Pol Pot's cohorts and "mass murderers of Cambodia." He stated that he was a supporter of "limited democracy," and named Thailand, Singapore and Japan as examples. Khmer Rouge economic policy, based largely on the plans of Khieu Samphan, focused on the achievement of national self-reliance through an initial phase of agricultural collectivism. This would then be used as a route to achieve rapid social transformation and industrial and technological development without assistance from foreign powers, a process which the party characterised as a "Super Great Leap Forward". The strong emphasis on autarky in Khmer Rouge planning was probably influenced by the early writing of Samir Amin, who was cited in Khieu Samphan's PhD thesis. The governing structure of Democratic Kampuchea was split between the state presidium headed by Khieu Samphan, the cabinet led by Pol Pot as prime minister and the party's own Politburo and Central Committee. All were complicated by a number of political factions existing in 1975. The leadership of the Party Centre, the faction headed by Pol Pot, remained largely unchanged from the early 1960s to the mid-1990s. Its leaders were mostly from middle-class families and had been educated at French universities. The second significant faction was made up of men active in the pre-1960 party and who therefore had stronger Vietnamese links. However, government documents show that there were several major shifts in power between factions during the period in which the regime was in control. Party cadres who had fallen under political suspicion: the regime tortured and executed thousands of party members,  including senior figures such as Hu Nim. The Tuol Sleng Museum of Genocide is a former high school building, which was transformed into a torture, interrogation and execution center between 1976 and 1979. The Khmer Rouge called the center S-21. Of the estimated 15,000 to 30,000 prisoners,  only seven prisoners survived. 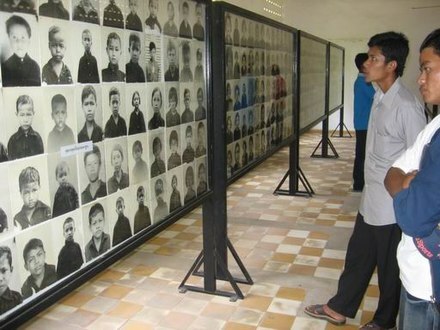 The Khmer Rouge photographed the vast majority of the inmates and left a photographic archive, which enables visitors to see almost 6,000 S-21 portraits on the walls. Visitors can also learn how the inmates were tortured from the equipment and facilities exhibited in the buildings. In addition, one of the seven survivors shares his story with visitors at the museum. Enemies of the People , a documentary film depicting co-director Thet Sambath's quest to find truth and closure in the Killing Fields of Cambodia. The Missing Picture , a documentary film illustrating the cruelty inflicted upon Cambodians when Pol Pot came to power through news footage and clay figurines. 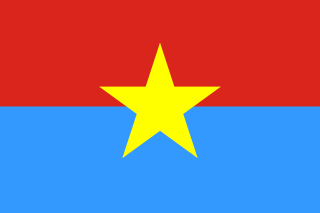 The Kampuchea United Front for National Salvation, often simply referred to as Salvation Front or by its French acronym FUNSK, was the nucleus of a new Cambodian regime that would topple the Khmer Rouge and later establish the People's Republic of Kampuchea (PRK). Lycée Preah Sisowath is a secondary school in Phnom Penh, Cambodia. The school was founded in 1873 as a collège and became a lycée in 1933. It is named after King Sisowath I. 1 2 3 Kelvin Rowley, ''Second Life, Second Death: The Khmer Rouge After 1978''. (PDF) URL accessed on 2010-07-27. ↑ Hartman, Tom (1985). A World Atlas of Military History, 1945–1984. Hippocrene Books. p. 81. ISBN 0870520008. ↑ McLellan, Janet (April 1, 1999). "5". Many Petals of the Lotus: Five Asian Buddhist Communities in Toronto (1st ed.). University of Toronto Press. p. 137. ISBN 978-0-8020-8225-1. ↑ Ratner, Steven R.; Abrams, Jason S. (2001). Accountability for Human Rights Atrocities in International Law: Beyond the Nuremberg Legacy (2nd ed.). OUP Oxford. p. 272. ISBN 978-0-19-829871-7. ↑ "Cambodia profile". BBC News. January 17, 2012. ↑ "No Redemption – The Failing Khmer Rouge Trial By Allan Yang". Harvard International Review. 2008. ↑ DeRouen, Karl R. (2007). 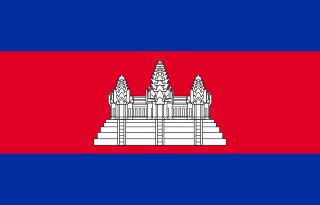 "Cambodia (1970–1975 and 1979–1991)". Civil Wars of the World: Major Conflicts Since World War II, Volume 1. ABC-CLIO. p. 231. ↑ Johnman, Albert J. (1996). "The Case of Cambodia". Contemporary Genocides: Causes, Cases, Consequences. Programma Interdisciplinair Onderzoek naar Oorzaken van Mensenrechtenschendingen. p. 61. ↑ Weitz, Eric D. (2005). "Racial Communism: Cambodia under the Khmer Rouge". A Century of Genocide: Utopias of Race and Nation. Princeton University Press. pp. 156–157, 162–164, 171–172. Someth May was a young Cambodian... [who] recalls... when a party cadre addressed a crowd [amidst deportation]: "As you all know, during the Lon Nol regime the Chinese were parasites on our nation. They cheated the government. They made money out of Cambodian farmers.... Now the High Revolutionary Committee wants to separate Chinese infiltrators from Cambodians, to watch the kind of tricks they get up to. The population of each village will be divided into a Chinese, a Vietnamese and a Cambodian section. So, is you are not Cambodian, stand up and leave the group. Remember that Chinese and Vietnamese look completely different from Cambodians.".... Under the new regime, the Khmer Rouge declared, "there are to be no Chams or Chinese or Vietnamese. Everybody is to join the same, single, Khmer nationality.... [There is] only one religion – Khmer religion. Similarly, a survivor recalls a cadre saying: "Now we are making revolution. Everyone becomes a Khmer." ↑ Fletcher, Dan (February 17, 2009). "The Khmer Rouge". Time. 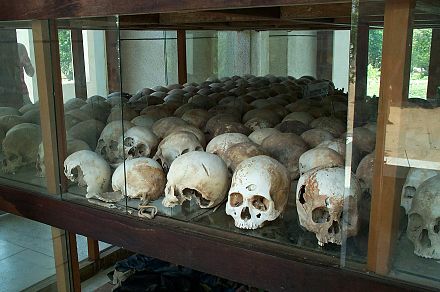 ↑ "Why the world should not forget Khmer Rouge and the killing fields of Cambodia". The Washington Post. ↑ Wessinger, Catherine (2000). Millennialism, Persecution, and Violence: Historical Cases. Syracuse University Press. p. 282. ISBN 9780815628095. Democratic Kampuchea was officially an atheist state, and the persecution of religion by the Khmer Rouge was matched in severity only by the persecution of religion in the communist states of Albania and North Korea, so there were no direct historical continuities with Buddhism into the Democratic Kampuchean era. 1 2 Morris, Stephen J. (April 20, 2007). "Vietnam and Cambodian Communism". Cambodian Information Center, Source: The Cambodian Human Rights and Development Association. 1 2 3 4 5 Tyner, James A. (2008). The Killing of Cambodia: Geography, Genocide and the Unmaking of Space. Ashgate Publishing, Ltd. pp. 44, 51, 54–55, 60–62, 68. ISBN 0754670961. ↑ Young, Luke (November 22, 2013). "Cambodian Political History: Former PM Pen Sovann's Left Perspective – Hostile to the Khmer Rouge and the Present Rulers". Centre for Research on Globalization, MONTREAL, Qc. ↑ "Norodom Sihanouk Obituary". Telegraph Media Group Limited, Telegraph UK. October 15, 2012. ↑ Yimsut, Ronnie (November 8, 2011). "Forward". Facing the Khmer Rouge: A Cambodian Journey. Rutgers University Press. p. forward XI. ↑ Khamboly Dy (2013). "Khmer Rouge History". 2013 CAMBODIA TRIBUNAL MONITOR. ↑ Bartrop, Paul R. (July 30, 2012). A Biographical Encyclopedia of Contemporary Genocide: Portraits of Evil and Good. ABC-CLIO. pp. Chapter on Pol Pot. ISBN 031338679X. ↑ Translated by Eng Kok Thay, Documentation Center of Cambodia (April 18, 1975). "Confession of Hu Nim". The Confession of Hu Nim, aka Phoas (Arrested: April 10, 1977; Executed: July 6, 1977). ↑ Elizabeth Becker (July 3, 2003). "Khieu Ponnary, 83, First Wife Of Pol Pot, Cambodian Despot". New York Times. 1 2 3 4 5 6 7 Frey, Rebecca Joyce (2009). Genocide and International Justice. Infobase Publishing. pp. 266, 267. ISBN 0816073104. ↑ Becker, Elizabeth (November 10, 1998). "The Birth of Modern Cambodia". When the War Was Over: Cambodia and the Khmer Rouge Revolution. PublicAffairs. p. 63. ↑ Short, Philip (April 1, 2007). "Initiation to the Maquis". Pol Pot: Anatomy of a Nightmare. Macmillan. p. 95. ↑ Kiernan, Ben (2004). "The Changing of the Vanguard". How Pol Pot Came to Power: Colonialism, Nationalism, and Communism in Cambodia, 1930–1975. Yale University Press. p. 241. ↑ Shawcross, pgs. 181–182 & 194. See also Isaacs, Hardy, & Brown, p. 98. ↑ Dmitry Mosyakov, "The Khmer Rouge and the Vietnamese Communists: A History of Their Relations as Told in the Soviet Archives," in Susan E. Cook, ed., Genocide in Cambodia and Rwanda (Yale Genocide Studies Program Monograph Series No. 1, 2004), p54ff. Available online at: www.yale.edu/gsp/publications/Mosyakov.doc "In April–May 1970, many North Vietnamese forces entered Cambodia in response to the call for help addressed to Vietnam not by Pol Pot, but by his deputy Nuon Chea. Nguyen Co Thach recalls: "Nuon Chea has asked for help and we have "liberated" five provinces of Cambodia in ten days." ↑ Online, Asia Time. "Asia Times Online :: Southeast Asia news – Dining with the Dear Leader". www.atimes.com. ↑ Jones, Adam (2006). Genocide: A Comprehensive Introduction (PDF). Routledge. pp. 189–190. ↑ Grandin, Greg (August 25, 2015). Kissinger's Shadow: The Long Reach of America's Most Controversial Statesman. Henry Holt and Company. pp. 179–180. ISBN 9781627794503. ↑ Rodman, Peter, Returning to Cambodia Archived November 10, 2011, at the Wayback Machine , Brookings Institution, August 23, 2007. ↑ Shawcross, pgs. 92–100, 106–112. ↑ Shawcross, William and Peter Rodman,Defeat's Killing Fields, Brookings Institution, June 7, 2007. ↑ Cook, Susan E.; Mosyakov, Dmitri (July 5, 2017). Genocide in Cambodia and Rwanda: New Perspectives. Routledge. ISBN 9781351517775. ↑ Blanchard, Ben (February 17, 2009). "China defends its Khmer Rouge ties as trial opens". Reuters. ↑ "Khmer Rouge | Facts, Leadership, & Death Toll". Encyclopedia Britannica. Retrieved November 5, 2017. 1 2 3 Kiernan, Ben (1997). The Pol Pot Regime: Race, Power, and Genocide in Cambodia under the Khmer Rouge, 1975–79. London: Yale University Press. pp. 31–158, 251–310. ISBN 0300096496. ↑ "Dam the Fish – Inter Press Service". www.ipsnews.net. ↑ Picq L. Beyond the horizon: five years with the Khmer Rouge. 1st ed. New York: St. Martin's Press, 1989. ↑ Locard, Henri (March 2005). "State Violence in Democratic Kampuchea (1975–1979) and Retribution (1979–2004)" (PDF). European Review of History. 12 (1): 134. ↑ Kiernan, Ben (2014). The Pol Pot Regime: Race, Power, and Genocide in Cambodia Under the Khmer Rouge, 1975–79. Yale University Press. p. 464. ISBN 9780300142990. 1 2 A History of Democratic Kampuchea (1975–1979). Documentation Center of Cambodia. p. 74. ISBN 99950-60-04-3. ↑ "Cambodian court sentences two former Khmer Rouge leaders to life term". The Cambodia News.Net. Retrieved August 8, 2014. 1 2 Sharp, Bruce (April 1, 2005). 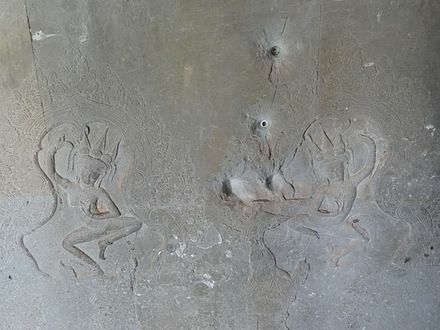 "Counting Hell: The Death Toll of the Khmer Rouge Regime in Cambodia" . Retrieved July 5, 2006. ↑ "Cambodian Genocide Program". Yale University. July 18, 2007. Retrieved July 27, 2010. 1 2 Morris, Stephen J. (January 1, 1999). Why Vietnam Invaded Cambodia: Political Culture and the Causes of War. Stanford University Press. pp. 25, 32, 93, 94, 95, 96, 97, 102, 103, 104, 107, 111, 159. ISBN 0804730490. ↑ Vickery, Michael (1984). 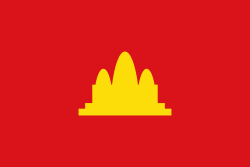 Cambodia : 1975–1982. Boston: South End Press. ISBN 0-89608-189-3. ↑ Daniel Bultmann (2015) 'Inside Cambodian Insurgency. A Sociological Perspective on Civil Wars and Conflict', Ashgate: Burlington, VT/Farnham, UK, ISBN 9781472443076. 1 2 3 "Kelvin Rowley, ''Second Life, Second Death: The Khmer Rouge After 1978''" (PDF). Archived from the original (PDF) on February 16, 2016. Retrieved July 27, 2010. ↑ "Margaret Thatcher – Transcript for the interview with Blue Peter in 1988". June 28, 2007. Archived from the original on January 21, 2010. Retrieved January 25, 2010. 1 2 3 4 Pilger, John (2004). In Tell me no lies", Jonathan Cape Ltd.
↑ Nate Thayer, "Cambodia: Misperceptions and Peace," Washington Quarterly, Spring 1991. 1 2 "CONTINUING UNREST" (Transcript). Pbs.org. PBS. June 18, 1997. Retrieved July 27, 2010. ↑ "Khmer Rouge leaders surrender". BBC. December 26, 1998. Retrieved August 7, 2014. ↑ Dombrowski, Katja. "Dealing with the past". D+C Development and Cooperation. Retrieved August 7, 2013. ↑ Kinetz, Erika.In Cambodia, a Clash Over History of the Khmer Rouge", Washington Post, May 8, 2007. ↑ "Search". Phnom Penh Post. ↑ De Launey, Guy (November 10, 2009). "Textbook sheds light on Khmer Rouge era". BBC News. Retrieved May 7, 2010. 1 2 3 4 "Extraordinary Chambers in the Courts of Cambodia: At a Glance", Phnom Penh, March 2012. ↑ "Outreach Statistics 2017 ECCC" (PDF). Extraordinary Chambers in the Courts of Cambodia. September 30, 2017. Retrieved October 21, 2018. ↑ "An Introduction to The Khmer Rouge Trial". Archived from the original on February 19, 2009. ↑ Sopheng Cheang and Luke Hunt (November 28, 2009). "Surprise plea in Khmer Rouge trial". Associated Press, via The Raleigh News & Observer. ↑ Shears, Richard (July 27, 2010). "Daily Mail Report on Comrade Duch's sentencing". Daily Mail. UK. Retrieved July 27, 2010. ↑ Petty, Martin; Prak Chan Thul (July 26, 2010). "Senior Khmer Rouge Cadre Jailed for Mass Murder, Torture". Reuters.com. Retrieved August 2, 2015. ↑ Maly Leng and Samean Yun (February 3, 2012). "Duch Appeal Rejected, Gets Life". Radio Free Asia. USA. Retrieved April 26, 2012. 1 2 ""Who can attend the trials?," Extraordinary Chambers in the Courts of Cambodia" . Retrieved April 21, 2012. ↑ Di Certo, Bridget. "KRT visits top 100,000 mark", Phnom Penh Post , Phnom Penh, 05 January 2012. Retrieved on 2012-04-21. ↑ ""Video Archive," Extraordinary Chambers in the Courts of Cambodia" . Retrieved April 21, 2012. 1 2 3 4 ""S-21 and Choeng Ek Killing Fields: Facing death," The Killing Fields Museum – Learn from Cambodia" . Retrieved April 21, 2012. ↑ ""Tuol Sleng Museum of Genocidal Crimes," International Center for Transitional Justice". Archived from the original on February 9, 2012. Retrieved April 21, 2012. 1 2 3 4 5 ""Choeung Ek, Center of Genocide Crimes," International Center for Transitional Justice". Archived from the original on May 28, 2012. Retrieved April 22, 2012. 1 2 ""Providing Genocide Education," Documentation Center of Cambodia" . Retrieved April 22, 2012. 1 2 Khateya. "Trials, tribulations and textbooks: Govt, DC-Cam review KR teaching" Archived March 27, 2014, at the Wayback Machine , Khmer Media, 21 January 2009. Retrieved on 2012-04-23. ↑ Khet, Long (2011). "Preface". In Youth for Peace (ed.). Behind the Darkness:Taking Responsibility or Acting Under Orders?. Youth for Peace. p. i. 1 2 "ICfC Fosters Open Dialogue between Victims and Cadres" (PDF), The Court Report. February 2011. Retrieved on 2012-04-23. ↑ Desai, Anuradha. "Through Dialogue, Healing Pain in Eastern Cambodia", International Center for Conciliation, Field Report, March 2010. Retrieved on 2012-04-23. ↑ "Welcome to Radio National of Kampuchea". www.rnk.gov.kh. 1 2 3 4 5 An Introduction to the Khmer Rouge Trials, p. 25. Secretariat of the Royal Government Task Force, Office of the Council of Ministers. Revised by Public Affairs Section of the Extraordinary Chambers in the Courts of Cambodia, Phnom Penh. 4th edition. ↑ ""ECCC's Weekly Radio Programme," Extraordinary Chambers in the Courts of Cambodia" . Retrieved April 21, 2012. ↑ Facebook (updates, text, news, photographs), YouTube (videos). Flickr (photographs), and Twitter (updates and news). Wikimedia Commons has media related to Khmer Rouge .